Even if you have managed to decorate your living space to your liking, empty walls and high ceiling can disturb the overall balance and coziness. Read the following tips to help you conquer the empty space and create a truly remarkable home. It is well known, that dark colours optically shrink space. Painting your walls a dark rich colour can save you from having to decorate the walls at all. Two-tone walls, with the darker colour on top, are an excellent option. If you insist on white walls however, you can always paint the ceiling only. Curtains are no longer there just to prevent nosy neighbours from peeping into our living space. These days they can serve fully decorational purposes. Moving your curtain rod high above your windows, closer to the ceiling, will optically shrink the space in between. The options are endless with the available materials, patterns and colours, whether it’s a sheer light panel to create a romantic vibe or a bold heavy drape to make a statement. Your shelves arrangement can become an art in itself. Playing with different heights and sizes can create a truly outstanding (and functional!) point of interest in your room. Displaying books, photograps, souvenirs and small decorative items adds a whole lot of coziness and personality into the space. One problem that high walls create is the echo. This can make any room seem empty and unwelcoming. Simply adding carpets, rugs, fluffy cushions and throw-overs will absorb most of the sound and will immediately transform your room into a den of comfort. 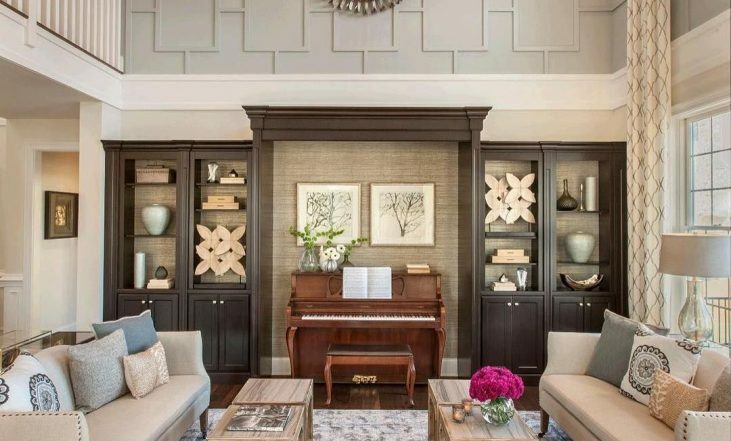 By using wood trim to create architectural interest, a tall wall goes from bland and boring to a piece of art itself. Further adornment isn’t necessary, when you have gorgeous floor-to-ceiling and three-dimensional texture. Adding a lavish and oversized chandelier, is one of the first tips you will find anywhere. Being both artsy and practical, gorgeous chandeliers will make a massive impression on anyone coming to visit. To match your oversized walls, you should up-scale the artwork as well. Large pieces are powerful enough to warm up any wall without overpowering it. Play with colour and texture to reflect your unique style. A single bold image, a group of smaller art pieces or a contemporary installation are great to connect the high ceiling with your floor and make the distance look shorter. Mixing sizes and subjects of your art distracts from the potentional emptiness and brings your walls inwards.